The post you are about to read is based on a true story…although some liberties have been taken.. :)It was January 2005. The day began, and went rather routinely – a trip to the store, some shopping and some pick-up basketball, and later an evening trip to the mall – but it wouldn’t end that way… As a last stop on my way out of the mall, I decided to stop by a Borders book store to browse the magazine rack for something to read other than NatGeo and Slam magazine. That’s when I spotted it. Something so powerful that it stopped me dead in my tracks. “How is this possible?” I said out loud. “How is what possible?”a companion said. I didn’t respond. I just stood their, mouth agape, staring at the most wonderful magazine cover I had ever seen in my entire life. It’s hard to admit it, but it was the cover of Maxim magazine that produced this reaction. 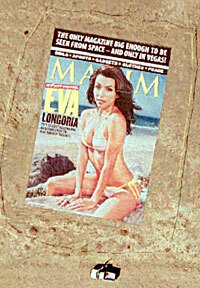 The January 2005 issue featured a stunning picture of a little known (at the time) actress named Eva Longoria. It went on to break records and become one of their most popular issues ever. Photography and beauty at their finest.. If this doesn’t bring extra-terrestrials to Earth/confirm whether they have any interest in us some time soon, then face it people…they don’t exist!